The Sonoran Desert covers more than 100,000 square miles in Mexico and the southwestern United States. Despite the hot, dry climate, the Sonoran Desert has two rainy seasons each year, allowing many types of plant life to thrive. This water source has allowed many birds to adapt and thrive in the desert. One of the native species of birds in the Sonoran Desert is the Gila woodpecker. These woodpeckers make holes in saguaro cactus for their nests. These holes are later used by other species as birdhouses. Since trees that host insects are scarce in the desert, Gila woodpeckers supplement their diet with cactus fruit and mistletoe berries. The greater roadrunner is one of the most famous desert birds. They can fly, but usually opt to run at speeds up to 15 miles per hour. Not generally shy birds, roadrunners are known for expressive personalities. They enjoy a broad diet including insects, snakes, lizards, rodents and other small birds. The most well-known wren in the Sonoran Desert is the cactus wren. Unlike the typical small and difficult-to-spot wrens, these desert wrens are spotted and striped and are often seen in groups out in the open. The cactus wren also holds the honor of being the official state bird of Arizona. Several types of owls make their homes in the Sonoran Desert. Owls hunt at night and feed on rodents, rabbits, snakes and insects. The elf owl, the smallest species of owl, makes its home in the holes in saguaro cacti. Other owls found in the desert include great horned owl, barn owl and burrowing owl. Most species of quail keep themselves hidden in their natural habitat. In the Sonoran Desert, however, the native Gambel’s quail are far less secretive due to the lack of vegetation to hide in. Quail are not good fliers and are often found in groups walking on the ground or on low perches. The region is also home to several species of hawks and eagles. Harris’s hawks usually live in small groups of three or four birds. They maintain a diet of rodents, snakes, rabbits and birds. Other common hawks in the desert include the red-tailed and Cooper’s hawks. Eagles are less common, but both bald and golden eagles live in this region. The golden eagle hunts larger prey, including jackrabbits. 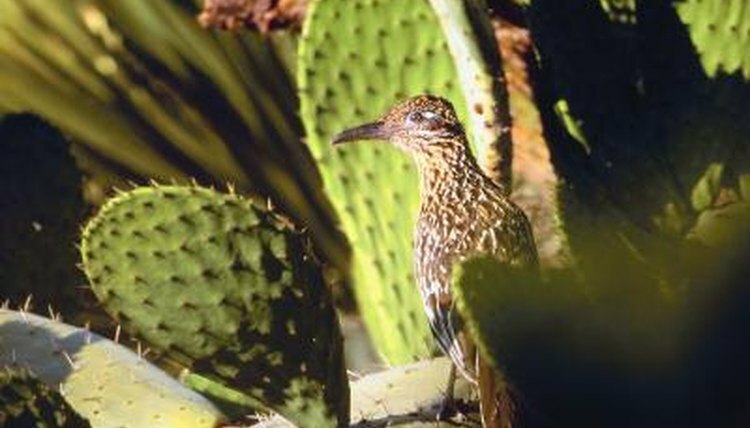 More than 350 kinds of birds live in the Sonoran Desert. Some other birds that live in this dry, hot region include doves, hummingbirds, sparrows, gilded flickers, finches and vultures.